Regional Information Center "CARPATHIANS" » CHURCH OF ST.BASIL THE GREAT. 1703, VILLAGE OF SIL. CHURCH OF ST.BASIL THE GREAT. 1703, VILLAGE OF SIL. According to Lviv restorers, this wooden church was built in the village of Syanky (Lviv region) in 1703. 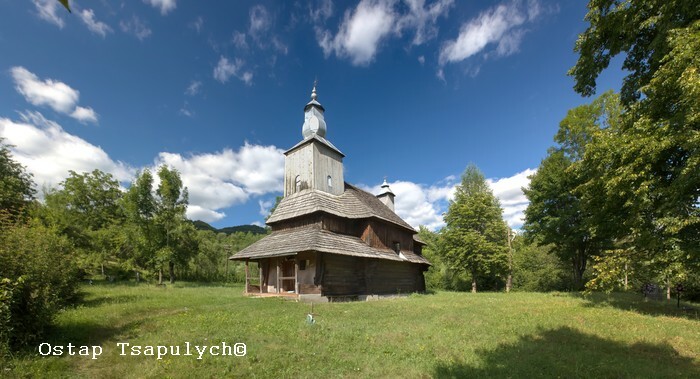 Originally it was a three-dome, Boyko style building, which was transported to the village of Sil at the end of 18th century (probably in 1777) using four pairs of oxen. It is possible that for a while the church maintained its Boyko style but in 1834 it was rebuilt. The church acquired a hipped roof, a small tower above “babynets” with a baroque finish, and a miniature tower with a conic roof above the altar. In 1970s the windows were hacked out, the iconostasis was disassembled and transported to somewhere in Russia. The only carved items left were the Sanctuary Doors, icon case and the altar with baldachin. The church doors were also replaced.